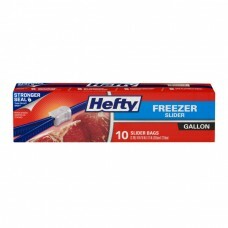 Hefty® Freezer Slider Gallon Bags. Stronger seal. Than Ziploc® bags†*. *When shaken dropped or stacked. Be sure it's Secure™. Helps prevent freezer burn. Keeping food fresh longer. 35% Thicker for better protection than Hefty® storage bags. Patented Maxlock® track design for an extra strong seal. Zips & Clicks Closed™ so you know the seal is secure. Reynolds Consumer products. To contact us visit: hefty.com, call: 1-800-433-2244 or write: Hefty Brands, PO Box 85583, Richmond, VA 23285-5583. When communicating about this particular product, please include end flap with the embossed number, or laser printed white numbers and the UPC bar code located on this panel. For patents see www.hefty.com/patents. Product not formulated with BPA. †Ziploc® is a registered trademark of S.C. Johnson & Son, Inc. 100% Recycled Paperboard™. Paper box. Recycle if clean & dry. Store drop-off. Plastic bag. how2recycle.info. ©2014 Reynolds Consumer Products LLC. Microwave instructions. For defrosting and reheating foods: Place bag on a "microwave safe" plate or dish. Open slider at least 1 inch to vent air. Do not overheat food or bag may melt and break. Not for roasting, baking or boiling.